How Do You Subtract Radicals with Like Radicands? Subtracting radicals can be easier than you may think! As long as they have like radicands, you can just treat them as if they were variables and combine like ones together! This tutorial takes you through the steps of subracting radicals with like radicands. Check it out! Adding radicals isn't too difficult. As long as they have like radicands, you can just treat them as if they were variables and combine like ones together! This tutorial takes you through the steps of adding radicals with like radicands. Take a look! How Do You Subtract Radicals with Unlike Radicands? Subtracting radicals isn't too hard. Just treat them as if they were variables and combine like ones together! Don't see like radicals? You may need to simplify the radicals so you can identify similar ones. 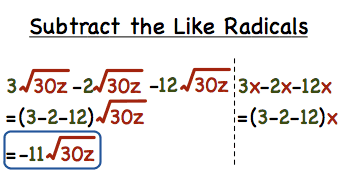 This tutorial takes you through the steps of subtracting radicals that must first be simplified. Take a look!